How to make a Pro Forma Income Statement Excel Format? An easy way to start is to download this Pro Forma Income Statement Excel Format template now! A pro-forma financial statement is the adjusted statements that offer great operating result to the investors. With these investors understands about the smooth earnings. By using this most of the organization manipulates financial results, the pro-forma financial statements highly useful to understand details about the investors that also estimate and give picture about income. Now we provide this standardized Pro Forma Income Statement Excel Format template with text and formatting to help you finish your document faster. If time or quality is of the essence, this ready-made template can help you to save time and to focus on what really matters! Hope this Pro Forma Income Statement Excel Format can help you a lot! 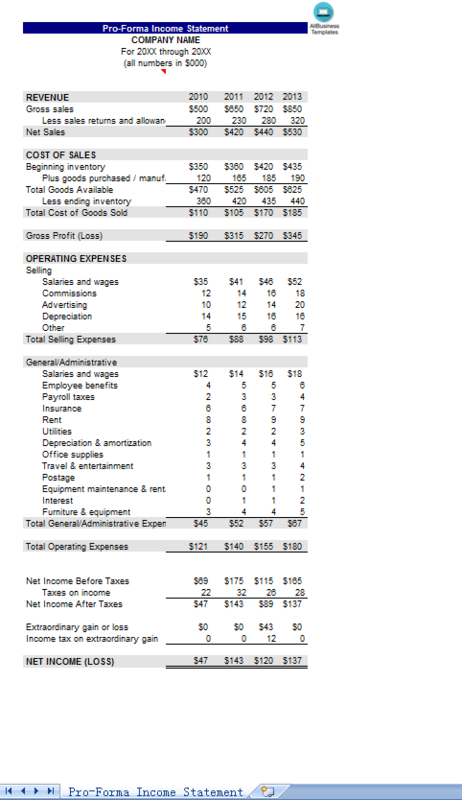 Download this income statement now and you can find more templates about income statements in our website. Download this Pro Forma Income Statement Excel Format template now! This template will perfectly suit your needs! And after downloading you can craft and customize every detail of its appearance very quickly.